Muzzles may also be used to prevent dogs from eating whatever they find while on walks or from licking wounds. 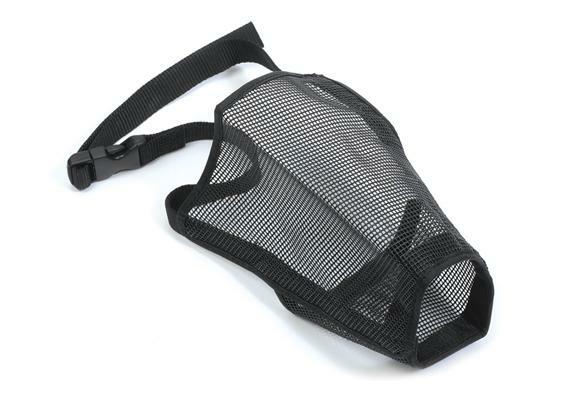 The nylon mesh is strong and reliable while being soft and comfortable for your dog to wear. There are 8 sizes of Mesh Muzzle available. 1. Use string or fabric tape to measure around your dogs nose. The muzzle must not be tight. Better a little loose than too tight!! 2. Place your forefinger under the string to ensure enough space for your dog to be comfortable – don`t tighten the string, it should be free to move around the dogs nose. 3. Measure the string and check off the muzzle size – if its not an exact match then take to the nearest size. 4. 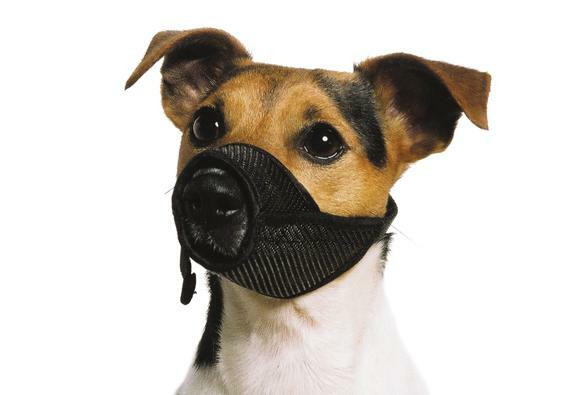 Fit the muzzle on your dog. Check the fit by running your finger inside the noseband. Your dog must be able to pant and have free tongue movement. Never leave your dog in a muzzle un-supervised.